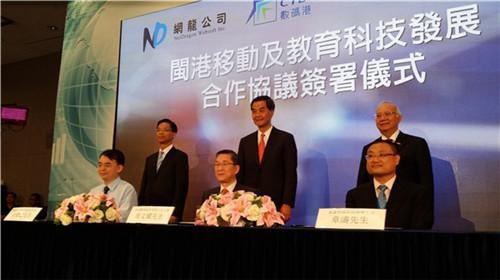 [September 5, 2014] NetDragon Websoft Inc. (“NetDragon” or “the Company”) (Hong Kong Stock Code: 777), a leading developer and operator of online games and mobile internet platforms in China, today reached a strategic cooperation agreement in Hong Kong. NetDragon, Hong Kong Cyberport Management Company Limited, and Hong Kong Wireless Technology Industry Association （WTIA） signed a letter of intent for a year. Three sides will jointly support HK IT companies and talents for marketing promotion in the mainland and provide the talent training courses and internship opportunities to push the cooperation and development of IT industry in both Hong Kong and Fujian. The letter of intent was signed by Mr. Paul Chow, Chairman of Cyberport, Mr. Dejian Liu, Chairman and Founder of NetDragon, and Mr. Tao Zhang, Chairman of WTIA. Mr. Leung Chun-Ying, Chief Executive of the Hong Kong Special Administrative Region, Mr. Leung Jingguo, Acting Secretary for Commerce and Economic Development, and Mr. Daniel Lai, the Government Chief Information Officer attended the signing ceremony. On the ceremony, Mr. Leung Chun-Ying made a passionate speech and reviewed the visit to Fuzhou headquarter of NetDragon at the beginning of this year. He expressed gratitude to NetDragon for pushing the cooperation between Fujian and Hong Kong and the youth talents communication, and also wished to create a bigger innovative cooperation platform in the future. Mr. Xiangyang Lin, CEO of Cyberport, believed that the cooperation would build a strategic partnership among three sides and further enhance the local information and communication technology. 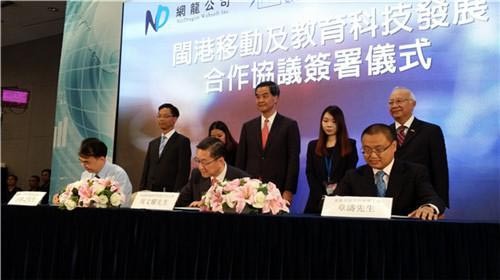 He was pleased to formally signed the agreement with NetDragon and WTIA to effectively combine the advantages and experience of NetDragon and the resource of Cyberport, so that an abundant achievement will be realized between Fujian and Hong Kong, and the information and communication technology will be lead to success. Mr. Liu Luyuan, CEO of NetDragon, said NetDragon always laid great emphasis on innovation, and he believed that this cooperation would train more creative technological talents and teams to energize the mobile internet and technological education in Hong Kong and the mainland. Mr. Tao Zhang, Chairman of WTIA expressed high expectations about signing the Cooperation Agreement. He believes the cooperation between NetDragon and WTIA will help more local mobile app developers expend bigger market in mainland, higher apps will be introduced to the users in mainland, bring forth a long-term development of the domain and industry in Fujian and Hong Kong long-term development. Professional training: train the talents for mobile app developing, online game and mobile internet education. Professional training will be held in Fujian and Hong Kong by NetDragon and Cyberpor. Boost the local mobile app developers to enter the mainland market: three sides will cooperate to promote the development and implement of the apps for mobile internet education, online game and enterprise solution. NetDragon will assist WTIA to promote the platform which contains the apps made in Hong Kong, and support in the online purchasing and distribution. Internship program: three sides will also cooperation to promote the knowledge exchange in communication technology talents and information between Fujian and Hong Kong. Internships will be available for Hong Kong college students who arranged by Cyberport. Digital classroom: to promote the mobile internet education, an exhibition center will be set up in Cyberport by NetDragon. The cooperation will strengthen Fujian and Hong Kong talents and knowledge exchange, accelerate innovation, and make full use of potential and business opportunities in mobile apps and games, create new opportunities for exchanges and cooperation.